This article is about the county of Norway. For other uses, see Akershus (disambiguation). Akershus [²ɑːkəʂˌhʉːs] ( listen) is a county in Norway, bordering Hedmark, Oppland, Buskerud, Oslo, and Østfold; it also has a short border with Sweden (Värmland). Akershus, with a little over 614,000 inhabitants, is the second most populated county by population after Oslo. The county is named after Akershus Fortress. 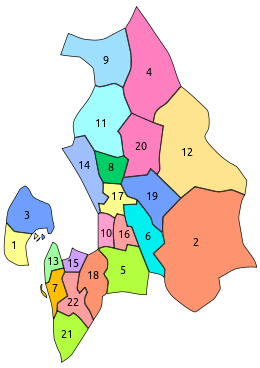 The county administration is in Oslo, which is not part of the county per se. The county also includes the historical place Eidsvoll, 48 km north of Oslo, in which the national assembly ratified the Norwegian constitution in 1814. South of Eidsvoll is the international airport, Oslo Airport at Gardermoen. Oslo's previous international airport, Fornebu, is also located in Akershus. The estate of the crown prince is located in Asker (the royal palace is in Oslo). ^ "Projected population - Statistics Norway". Archived from the original on 2012-05-26. Retrieved 2018-10-06. ^ "Immigrants and Norwegian-born to immigrant parents, by immigration category, country background and percentages of the population". ssb.no. Archived from the original on 2 July 2015. Retrieved 26 June 2017.